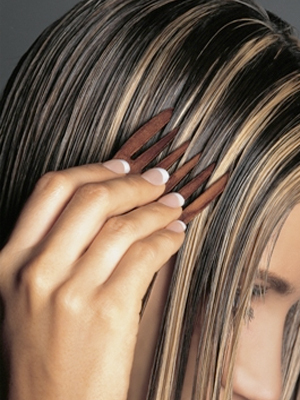 This genius invention simply combs hair dye into wet hair (see ya later, laytex gloves!). It’s still waiting for a license, but the concept of simultaneously combing and colouring sounds like a lifesaver/timesaver. After all, if the comb is shaped to reach even the peskiest grey areas (at the roots), at-home colouring may become a breeze. Have you ever cursed the inconvenience of unplugging your laptop and bringing it to the bathroom while you watch online how-to makeup tutorials on YouTube? Well, even if you haven’t, Stila has taken the combination of makeup and technology to a new level with the introduction of the 4.0 Makeup Player: a train case with built-in speakers, media dock and mirror so when you watch Stila’s makeup tutorials on your iPhone, you can get the full HD experience. Shaped like a horse’s grooming brush, the Tangle Teezer has put chemical de-tanglers to shame with its unique shape and bristle positioning, so that instead of breaking your hair or pulling it out, it simply works through the knots painlessly. The best part is that you can use it on dry hair and wet, so instead of taking to a comb or a bottle of tear-free children’s product, you can work through tangles without cursing or contemplating a pixie cut. Where were you about 63 years ago when I needed you, I think you have a great website, and you give anyone all the different ways to look great, I wish you well.